Readers sound off on John Yoo and Burmese immigrants. If anything, Robert Gammon understates the problem with the Justice Department analysis exonerating John Yoo. Lawyers are usually constrained from giving bad advice by the possible disastrous consequences for clients. The usual constraint did not apply in this case because Yoo was in the peculiar position of being able to immunize his clients from the consequences of acting on his advice. Therefore, he should be held to higher standard for two reasons: because he had an additional obligation to safeguard the rule of law as a quasi-judicial officer in the executive branch, and because he was not subject to normal constraints as a lawyer giving advice to a client. The analysis accords Yoo a presumption of good faith based on the apparent sincerity of his extremist views on executive power. But those views relate to what the law should be, not what the law is. Such views are not normally accepted as a basis for legal advice. He must have known that his views on executive power, later repudiated, might not be accepted because he backstopped his conclusions with unsupported interpretations of statutory law and international conventions. In making these claims, he was again unconstrained by the professional obligation to consider the normal consequences for a client who engages in criminal behavior in reliance on such claims. I'm sitting here with two papers on the couch. 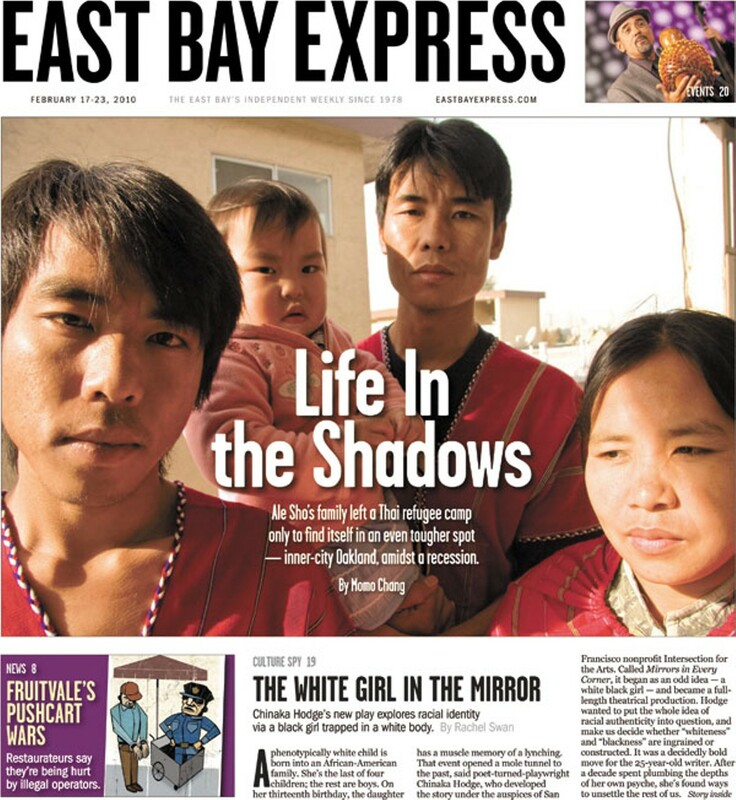 One cover of Wednesday, February 24th's Tribune has an angry Asian principal irate over some graffiti on a garage neighboring "her" East Oakland school, and the other paper, the East Bay Guardian, has a frightened-looking Burmese family, refugees recently arrived from a Thai camp. The Burmese want to go back to the camps. Oakland scares them. Some "African American" boys robbed them. The angry principal on the Oakland Tribune calls out "loud enough for the boys to hear, 'Look, look who's rolling by up here!' at 11:30 in the morning, more truant black boys. Of course she has a right to be upset, we all do. I recently heard a report stating most incarcerated men are kinesthetic learners. That means they work best with their hands and bodies. Most incarcerated men are black. I've worked with juvenile teens (mostly black) in trouble with the law and they are amazing kids who have not been given the opportunities to work creatively with their hands. They also don't want to "join up" in a system they fear. What is the message behind their behavior? Could be "I'm bored and afraid and these poor Asian kids are going to make it and I'm not." I hate to be stereotypical, but Asian kids sit down and do busy work better than most. White kids are in private schools that offer the arts and where unruly kids get thrown out. Latino kids are often passive players as well until the confusion so easily taught in public schools triggers their hopelessness. Thousands of poor folks from hundreds of nations are all diving for the piece of the pie, some victims and some feared. Gangs are a product of the survival brain, the lower brain, running on fear. When the need for small and gross motor activity in the body is fed intentionally, academic acquisition is easier so reading and math is actually, scientifically proven to be stimulated through movement. When movement is stymied as it is in the schools, self-esteem goes by the wayside and behavior problems arise. Before we go on hating these boys or inviting refugees whose lives we as a nation did not destroy (like some Iraqis or Hmong) let's use tax dollars to train our kids to constructively use their hands to build roads and bridges, handle test tubes, scalpels and stethoscopes, hang wires on telephone poles, construct houses, play instruments, dance, act, play sports, and then find them well-paid work and higher education when they graduate high school. 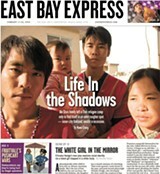 The name of our paper is the East Bay Express. In our profile of Briana Miller and Steve Loewinsohn (Insider's Guide, 2/24) we listed the incorrect address for their blog, From Broadway to Bancroft. It's www.broadwaytobancroft.com.